This steak seasoning recipe makes the perfect gift for all the men in your life who enjoy a tasty steak on the grill. Mother’s Day is usually easy to figure out, but Father’s Day has always been a little tougher for me. In fact, I think women are easier to buy for in general. However, most of the men in my life enjoy a good steak off the grill. So, I thought it would be fun to come up with a homemade steak seasoning, or rub, to give to the fathers in our family. Using nine of the many spices in our cupboard I came up with this blend, and so far we are loving it. Since I don’t have a spice grinder, I used a large plastic bag and a wooden mallet to crush some of the seeds and peppercorns. I wasn’t worried about getting them 100% crushed, because I kind of like the rustic nature of some of the seeds. 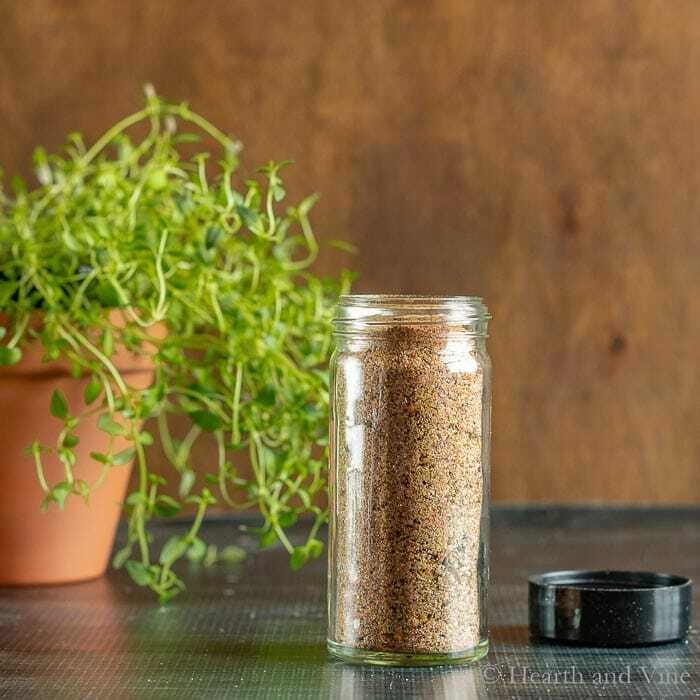 This recipe is enough to fill this 4 ounce spice bottle , so if you want to make it for gifts, you can increase the amount accordingly. This blend tastes great on other cuts of meat, such as pork chops, or chicken. I haven’t tried it on seafood yet, but I would suspect that it would be great on a meaty tuna steak. To use, rub the steak seasoning liberally on both sides of your steak. Grill your steak to the perfect medium rare or whatever your favorite cooking temperature is and enjoy. We have been eating steak a lot lately and I always like having steak seasoning on mine. My nutritionist told me that I had to watch what was in my spices so I’m glad you took out all the work for me to come up with my own! Can’t wait to try this! That’s great Denise. I think you’ll like it and at least you’ll know what’s in there. Of course you can adapt it any way you like. Pinned. Going to try this, sounds wonderful! Thanks Jonni. I hope you love it as much as we do. Well can I just say that this gal enjoys a good steak too. Especially after working outside all day. I’m getting our little grill out this weekend, been meaning to do this for a couple weeks now and switching gears to grilling meals. This seasoning recipe is perfect timing.